Having been called out for its use of Apple icons on an App Wall in one of its Italian stores, Samsung has moved quickly to cover its embarrassment by replacing all of the Apple-centric images with new Samsung “S” icons, an icon used on some of its most powerful smartphones. With Samsung currently engaged in a massive legal battle with Apple over which company has been stealing the other’s designs for phones and tablet, the image, discovered by All Things D, wouldn’t do much to help Samsung’s case. 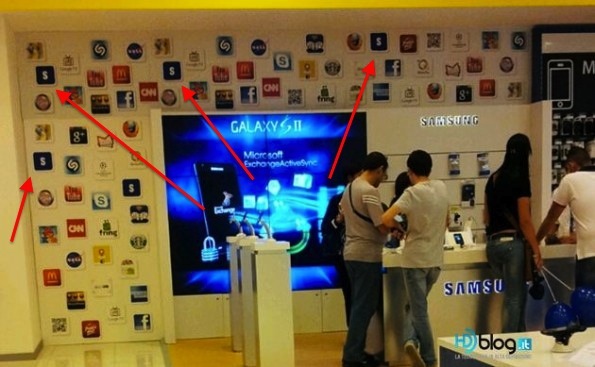 Since the Centro Sicilia store in Catania is a ‘store within a store’ it is possible that Samsung was not responsible for the display but it seems like it was endorsing it with the branding positioned the way it was. As you can see in the images below (taken by HDBlog), the offending icons have been replaced, returning the wall to a purely Android and Samsung affair.